12 inch powermatic. 5 hp 3 phase includes converter. What’s it worth? That is apparently a PM68, which is sort of an odd duck and wasn’t produced for very long IIRC. Parts and information might be a bit difficult to find because of that. 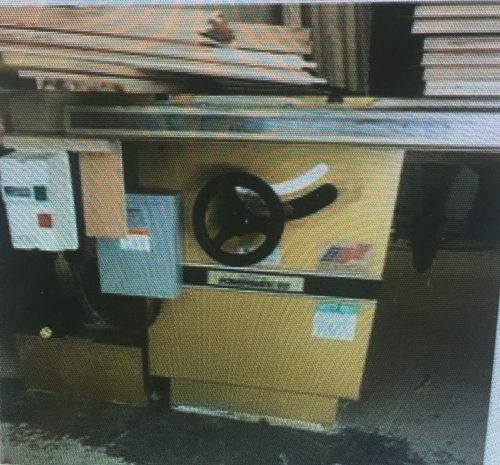 It is a bit more machine than the 10” PM66, but not as substantial or capable as the 12/14” PM72, which is why they didn’t sell many of them (most people just opted for the more proven PM72 if they were looking for a 12” saw). It also has a 5/8” arbor, so while you could run standard 10” blades in it, you would need an adapter bushing to run most 12” blades. Also, the three phase converter is most likely a static one, so you won’t be getting a 5hp saw, more like a 3-3.5hp one – and the unbalanced supply voltages can be rather rough on them. Can’t really tell much from that picture, but I’d probably go up to a couple hundred at most… but that’s just me. A couple hundred as in 200 dollars?